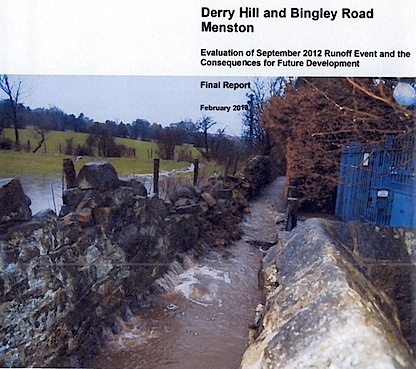 A comprehensive report on the potential flooding as a result of the developments proposed at Derry Hill and Bingley Road, Menston, was prepared by expert consultants JBA Consulting. The complete evidence, including the report, can be seen by clicking the link below the picture. “This is the report that the BMDC Solicitor told the planning panel on the 4th April they were not intelligent enough to understand and therefore there was no point in them seeing it. I will leave you to decide if his judgement was accurate or not and decide what value a planning panel!”. Steve Ellams, Chairman, Menston Community Association.